Leaving Bolzano, heading for Salzburg, the GPS took us totally the wrong way to what we had planned, but it turned out to be over really good roads. It was cold riding, and started raining, then Lyn's bike started cutting out again, time to stop for a cup of tea and thaw out. It was a good decision, the rain passed, we just got some light drizzle, but nothing heavy. We booked into a room about 10 kms outside of Lienz, which took some finding, as there was no phone reception, and we hadn't written down the name of it. We found it, asked the owner, she said no, not here, so headed off into the nearest village, then she chased us in her car and said yes, that was it. The booking came in via email late! We had tinned tuna for tea, too cold and wet to go to town! View from the train, cold and snowy out there! With Jules and Wayne, that snow should be INSIDE the fridge. went back to Salzburg, where we visited the castle and museum, then went to see the movie, "The Second Best Marigold Hotel". A 300 metre jog to catch the bus topped of what was a good day after all. With Anna and Sylvia on the last night. Anna's friends came over, and we talked until the early hours of the morning, a great night. Chris helped us with a computer issue, thanks mate! guest house, but it was like coming home. 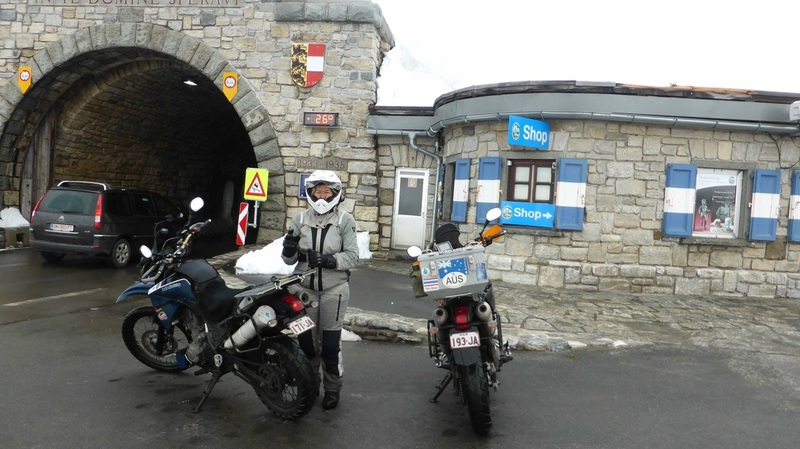 A good nights sleep, then off to the Grossglockner pass, it was open, but snowing at the top, and the digital thermometer at the top said 0.2 degrees when we went through the tunnel, and had soared to 2.8 on our way back! The scenery was indescribable, well worth the cold and wet ride. From there back to the room, spend some time checking the bikes over, and meet Wolfgang and Tamara, two other guests who turned up on bikes for the night. Tomorrow we're off to Slovenia. That digital thermometer said 0.2 degrees earlier!